Spend the next two weeks giving your representatives (and Donald Trump) hell. Last time members of Congress were on recess, thousands came out to confront them. Videos circulated of representatives facing impassioned constituents demanding to know why lawmakers would play politics with their health care. Some of the most dramatic confrontations involved representatives in Republican-dominated states, such Utah’s Jason Chaffetz and Tennessee’s Diane Black. 1. Demand Congress vote on Trump’s new war in Syria. To start, Congress should not have left for recess without voting on President Trump’s illegal military escalation in Syria. As you’re meeting with, confronting, and calling your members of Congress, let them know that they must debate and rein in Trump’s attacks on Syria. You can also sign our petition here. 2. Confront your representatives in person. 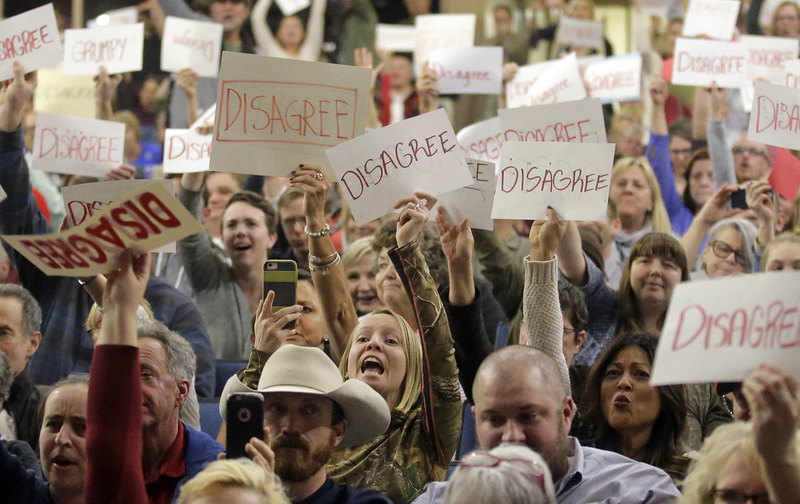 There are a number of resources to help you find town halls and protests in your area, connect with the organizers behind the actions, or organize your own protest or meeting with a lawmaker. Check out MoveOn.org’s Resistance Recess calendar and map, as well as the Town Hall Project’s map of town halls, both of which make it easy to find events. Even if your representative won’t hold a town hall or meet with you, you can join with others to call them out for their cowardice, as activists are doing in Chris Collins’s district in upstate New York and at Senator Portman’s office in Columbus, Ohio. To help you plan, check out Resistance Recess’s tool kits on issues such as President Trump’s attacks on climate science and proposed draconian budget cuts, as well as Indivisible’s resources on how you can make your town-hall actions effective. Also check out Free Press’s talking points on Net neutrality, as many senators and representatives are just as eager as our president and FCC chairman to repeal rules protecting the open Internet. 3. Join the Tax March on Saturday, April 15 and demand to see Trump’s tax returns. Planned for Washington, DC, and cities around the country, organizers are demanding that the president release his tax returns, with the DC march and others also calling for Congress to pass legislation requiring President Trump and all future presidential candidates to release their returns. Find a march near you and more details here. And in the week leading up to the march, help spread the word by creating a video detailing why you want to see Trump’s returns. March organizers are asking people to post their videos to Twitter using the hashtags #Whatareyouhiding and #TaxMarch so Tax March partners can retweet them. 4. Keep calling. On the days you can’t confront your members of Congress in person, find their district numbers (typically located on their websites), and call them.